Cooper Sprints to Victory & Putting Things In Perspective! If things pan out over the remaining five games, this will have been the pivotal game that we can look back on. Just a shade over a month ago, as the Cowboys hit their bye week, they were down two games to these same Redskins. At least for the time being they’re sitting in a good seat tied with the Redskins heading into the game versus Drew Brees & Co. Let’s look at this game and how things came together. Dallas got things rolling on their first possession as Zeke knocked it in from 16 yards out off left tackle. Let’s stop there for a moment and remind ourselves of who that was out at tackle. Cameron Fleming got the late word that he’d be starting when the stinger in Tyrun’s neck was bad enough to take him out of this contest. 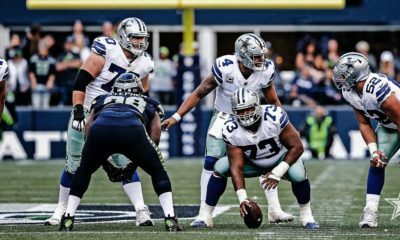 That meant that there were now three changes on the Dallas offensive line since the start of the season. A year ago, this team struggled mightily when the blind side wasn’t protected during Smith’s absences. 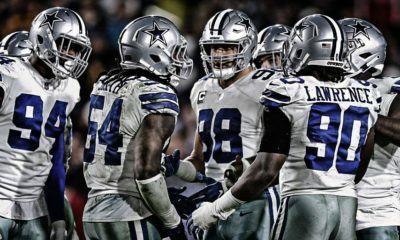 Realize in this game that these key players & starters were out: Sean Lee, Tyrun Smith, Travis Frederick, Connor Williams, Taco & David Irving. In the past, that would have been a recipe for grave concern and generally losses. Now, the team is building with quality depth to get thru those injuries. This team couldn’t win in the past without Lee or Tyrun, let alone both. Major tip of the cap to the players that have stepped in for each of these injured players and to Will McClay and his staff for finding the badly needed depth for this roster. Here’s Zeke’s dash to the end zone. This should be a major takeaway from this game. While Zeke carries the rock, its these guys up front that are doing the heavy lifting for him. Take two minutes to watch and listen to former Cowboy, Brian Baldinger break down a few plays. 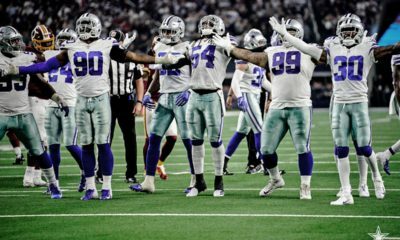 Since the offensive line coaching change three games ago, to Marc Columbo, these guys are doing great work in front of Zeke, who’s gone for 394 yards & three rushing TD’s, on just 68 carries, a 5.79 YPC clip. Add in his 18 receptions in these three games for 137 yards and one TD. Extremely productive. We can talk about all the playmakers whose star shined bright in this game but there were two names, we really didn’t hear a blessed thing about them. Did you hear the name Ryan Kerrigan, a true Dallas nemesis? We were spared hearing his name and his muscle flex pose after his sacks because of the really solid game by La’ell Collins. The man didn’t gain a yard, didn’t catch a pass, no highlight plays, but big time kudos for the work he did to control their perpetual motion DE. Great job by #71 …..
After that 2nd Cooper TD, the game was playing into the hands of the Cowboys. Coming into this game I was banging the table for this defense and the backers (LVE & Jaylon) focused to shut down Adrian Peterson, forcing McCoy to win the game basically by himself. Frankly, everyone was flying to the ball, great work by the corners in particular to bottle up the outside run attempts. While McCoy threw for 268 yards and 2 TD’s, he also had three completions to the Boys in white & blue jerseys. I’ve included clips for all three interceptions, which I had to do because the first two were by my Pet Cat’s from the last two years, Anthony Brown in 2016 and Xavier Woods in 2017. The third was an incredible play by a very gifted athlete. Only his athleticism and superior balance enabled Tank Lawrence to make the pick as his man was intent on going low and hitting him with a cut block. Demarcus fought that off and made a case for playing CB at some future time with those hands hauling the pass in. LOL! 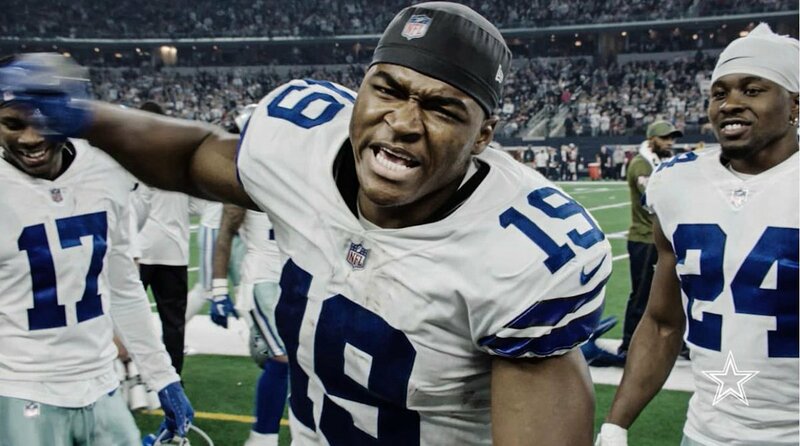 Entering this game Dallas only had 4 INT’s (two by LVE) so getting three was outstanding and worth bringing them to you. Fortunate to find this clip by Brian again, that shows the line play focusing on Lawrence. Excellent work by Tank and nicely analyzed for us. 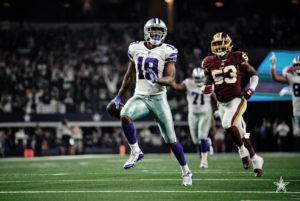 The final scoring play by Dallas was one we’ve grown accustomed to seeing our QB’s twist and spin to extend plays and coming up with sensational results. 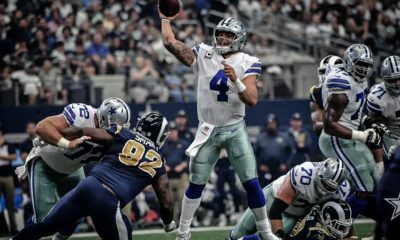 Here Dak, seemed like a deer in the headlights but escaped out the back door, did some razzle dazzle and essentially put Washington out of its misery. At times throughout this game I was a bit chapped that our defense was yielding yardage to McCoy, granted they were passing on most downs. But it disturbed me for a time, until I realized that while the game was still undecided that the defense did what I’d hoped and kept them to only 13 points midway thru the third quarter. Once Dallas took the lead 31-13, it was all about playing “tick tock” and running out the time remaining. It softened my angst with McCoy being as productive as he seemed to be. Getting three holiday gifts from him, is really what you want and the Lawrence INT set Dallas up at the Redskin 17, leading to that Dak TD. Rare to get a turnover, let alone one that lands the Cowboys in the “red zone”! 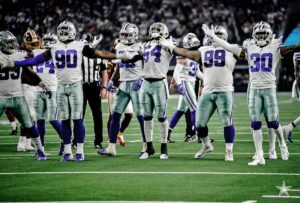 Well, I’ve given some light on the offensive lines performance, the work of the latest rendition of the Triplets and sprinkled in some defensive standout performances. These were many of the positives to take from this game. I’ll rewatch the tape and get back to you with the things that concern me. We now move on to facing the hottest team in the league in the New Orlean Saints. This game should serve to show how far they’ve truly come or how far they need to go. Gives us something to ponder entering this upcoming battle next Thursday evening. Turkey Day Extravaganza! Season’s Hopes Hinge on Outcome …..
A Call for History to Be Repeated! Defense is the Key …….